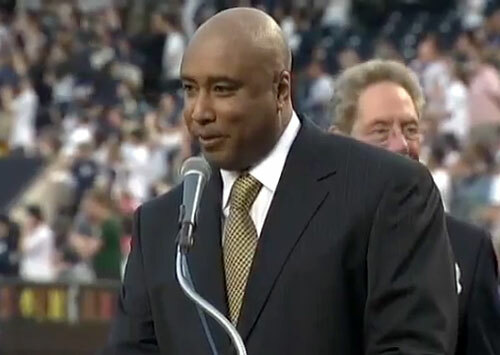 Bernie Williams is a former MLB center fielder who played his entire 16-year career for the New York Yankees from 1991-2006. Williams is a four-time World Series champion for 1996, 1998, 1999 and 2000 plus he is a five-time All-Star for 1997–2001. Williams is the American League Championship Series MVP for 1996 as well as the American League batting champion for 1998. Williams is a four-time Gold Glove Award winner for 1997–2000 as well as the Silver Slugger Award winner for 2002. His #51 was retired by the New York Yankees in 2015. Sports Speakers 360 is a booking agent for pro athletes. If you would like to book Bernie Williams for a speaking engagement, appearance or endorsement, contact a Bernie Williams booking agent for fees at 1.855.303.5450.